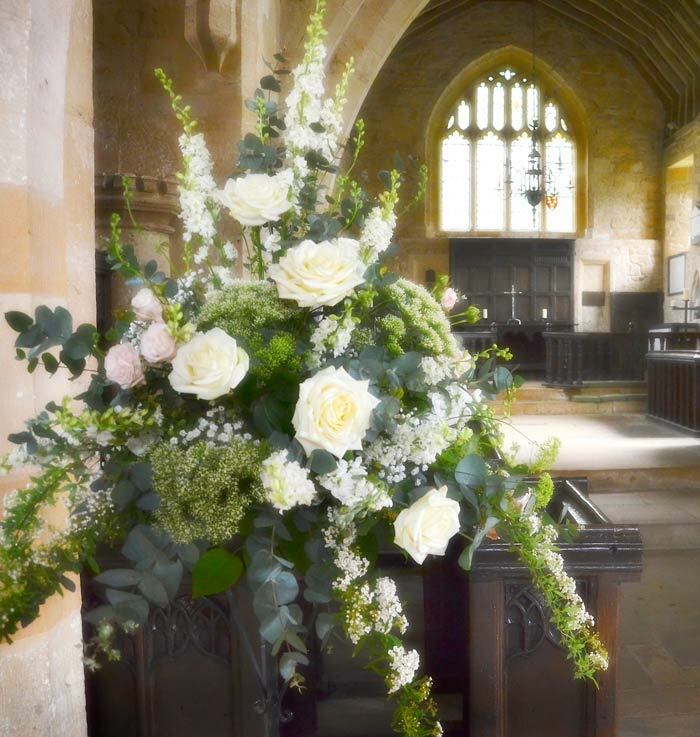 Have a look at some of the lovely wedding flower design that Rose and Grace have been privileged to be involved with. From early on in their thoughts, wedding flowers have played an important part in setting the atmosphere for these brides' perfect day. 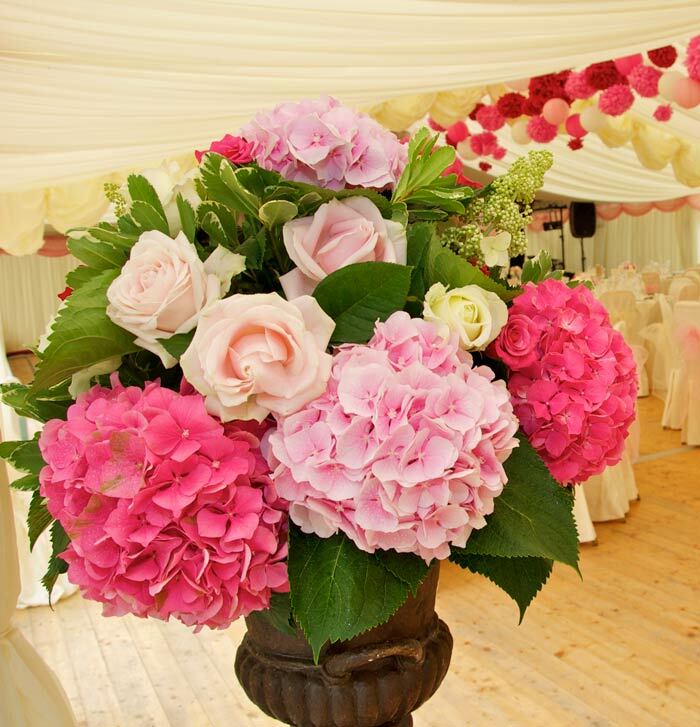 Bright pink hydrangeas and roses were the main flowers in Julia's bouquet and table decorations. 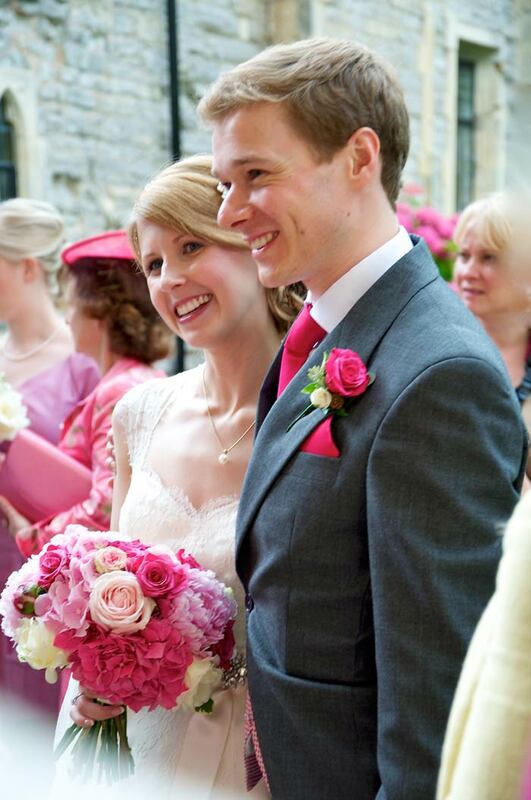 Married in August at Tewkesbury Abbey, with a reception at The Beckford Inn, near Cheltenham, Julia and Simon's flowers looked perfectly pretty in pink! 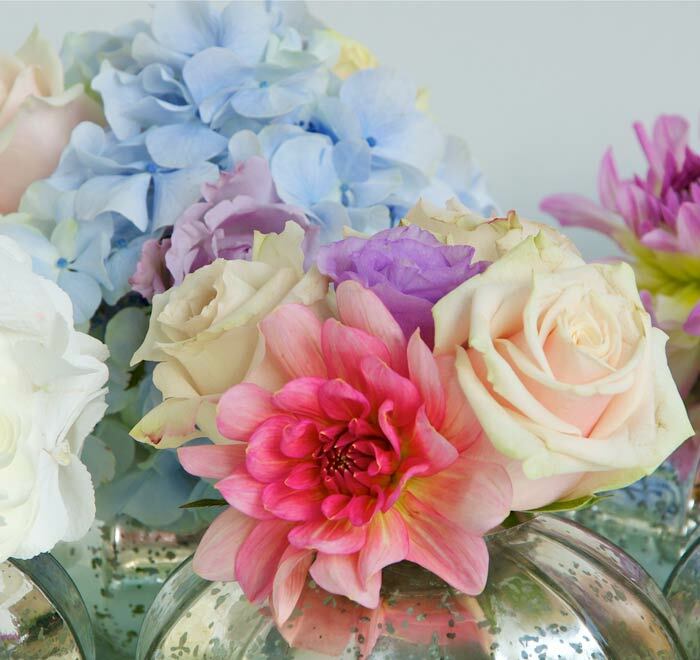 Every new wedding brings its own unique set of ideas for flowers. 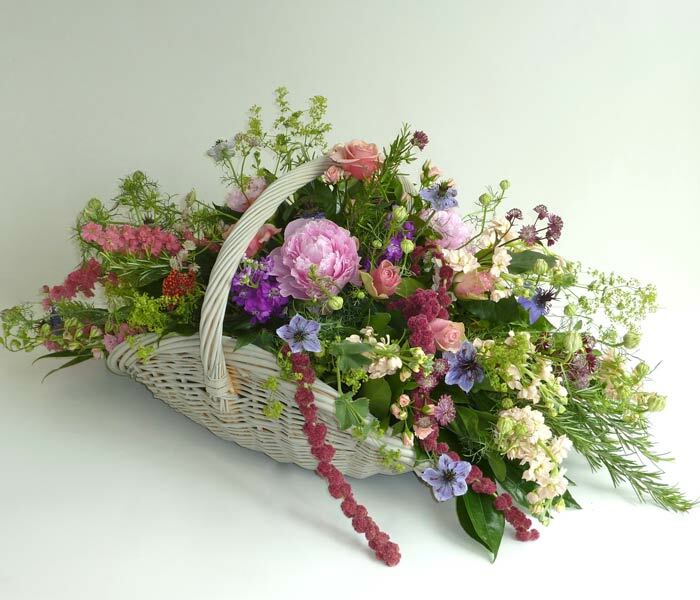 When you are planning ahead, it is good to know that you are in the hands of an experienced florist such as Catherine Young. Birtsmorton Court, a magical venue for Elana and Rob's mid-summer wedding. 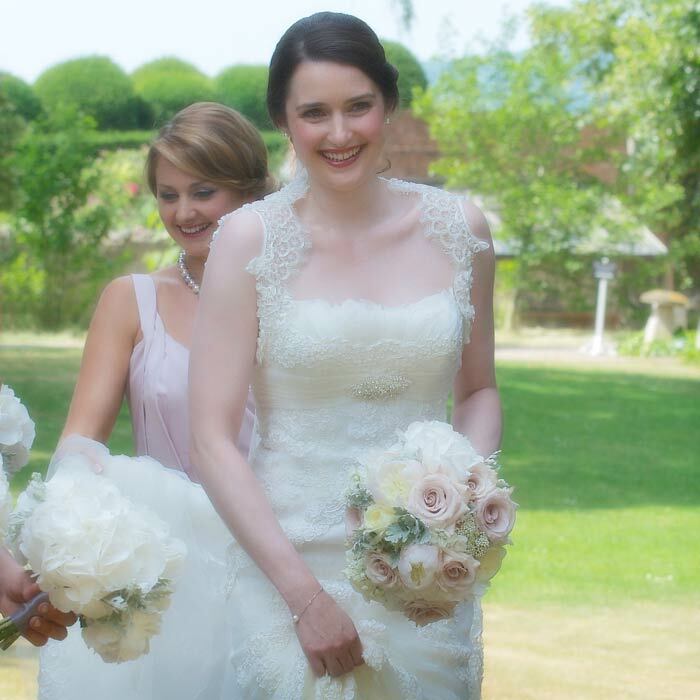 Her bouquet of white hydrangeas, champagne roses and soft, blowsy peonies was a perfect match for an English Rose. 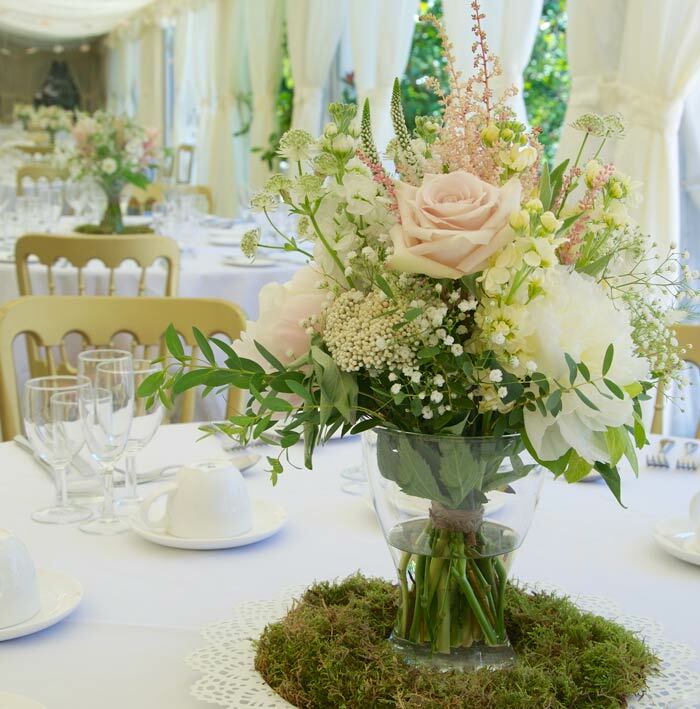 Glass vases placed on a bed of moss gave a fresh out of the garden feel to the table centre pieces in the marquee. Get in touch now to discuss your thoughts and let Catherine come up with some really exciting and memorable designs, perfectly tailored to suit you. 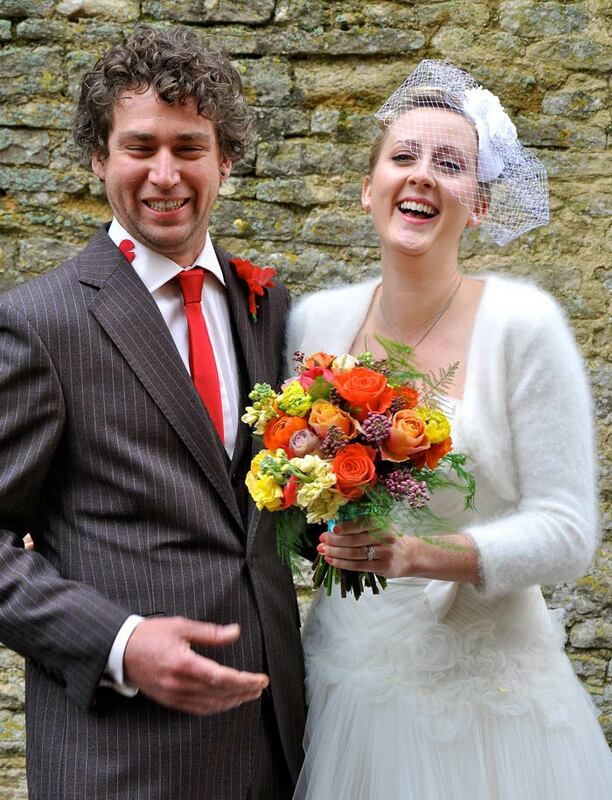 A happy retro wedding in the historic Oxfordshire town of Woodstock. 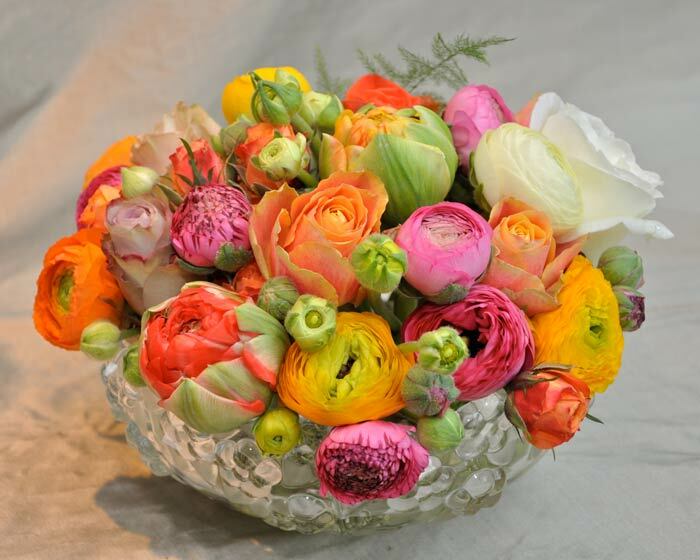 Brilliant clashes of carmine red roses with bright pops of gorgeous spring ranunculus. Amanda and Ron's Rockabilly wedding flower design theme included milkshakes, ice cream cornets and table flowers in vintage china and glass - all good enough to eat. 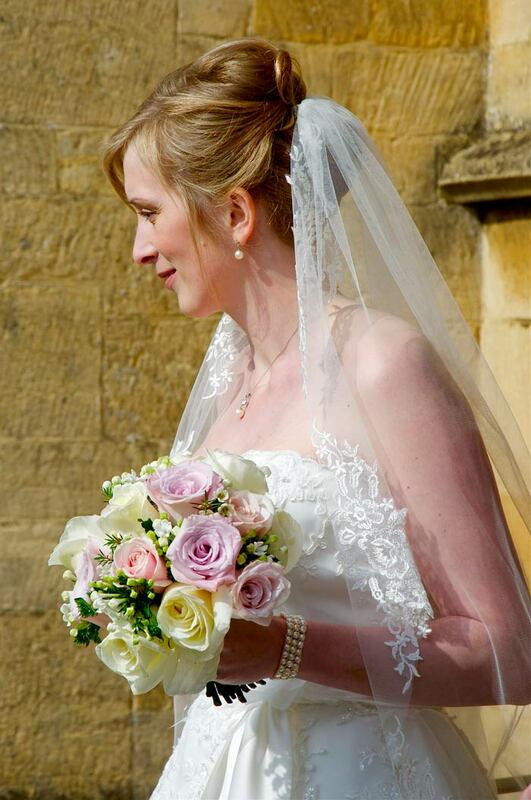 Monika's bouquet was a classic mix of vintage roses in creams and pinks with a touch of bouvardia. 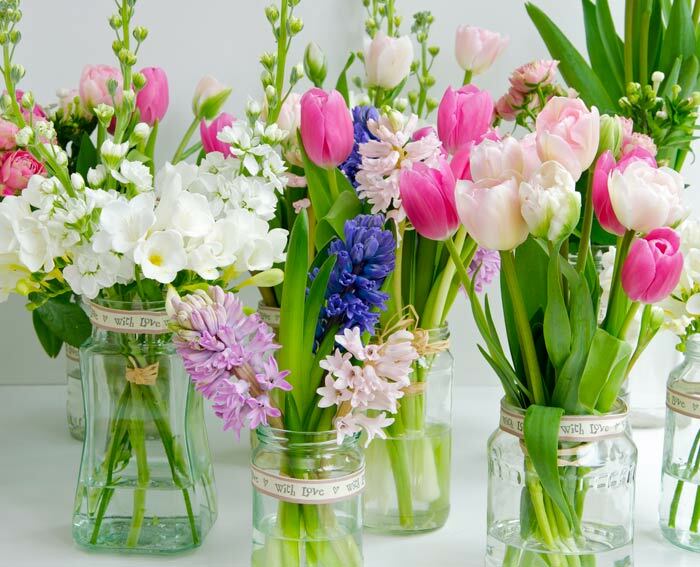 A rustic barn at The Kings Arms in Mickleton, near Chipping Campden, for the reception was decorated with simple jars of seasonal spring flowers - Tulips, Hyacinths, Stocks and Ranunculus. 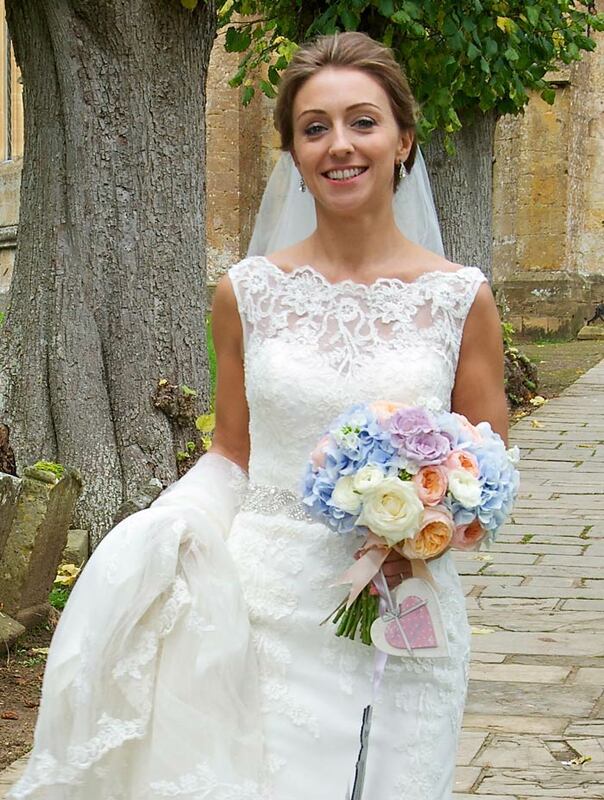 Charlotte was married at St. Andrews church in Hampton, near Evesham. Her choice of classic white roses, accented with a midnight blue ribbon to link with her bridesmaids, was a perfect, classic combination. Stephanie's bouquet attracted lots of comments on the colour combination. It was likened to a watercolour with its subtle blended tones with a 'pop' of peach David Austin roses. The Cotswold House Hotel in Chipping Campden hosted the reception. Long tables with a ribbon of silvered mercury glass vases, glowing with soft autumn blooms came to life with candlelight from Moroccan lanterns. Starlie and Clifford were married at Dumbleton Hall in August and had a clearly vintage theme, with a twist. The beautiful garden rose, "Caramel Antik" enhanced the other colours of her bouquet and sweet peas added a heavenly fragrance. A brighter mix of summer flowers was used for their reception wedding flower design. 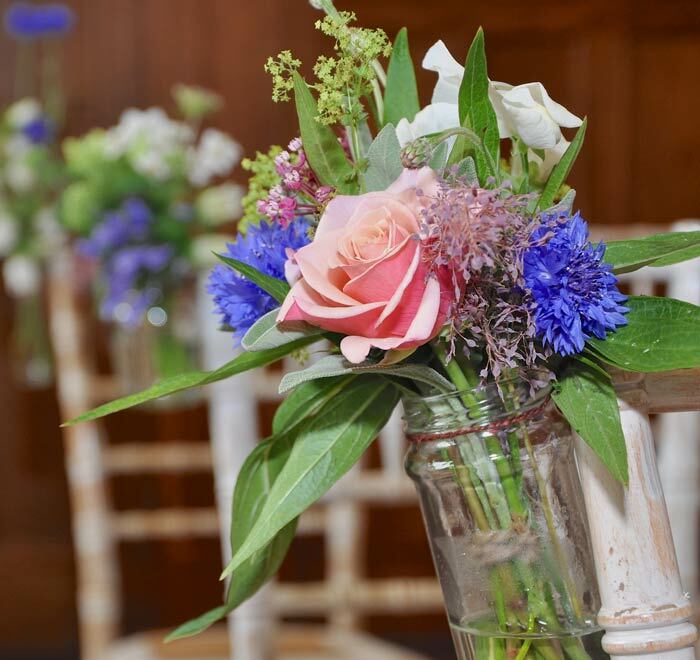 Pew ends consisted of simple bunches of summer flowers including roses, sweet peas and cornflowers in jars. A happy scene after the wedding of Faith and Jon. 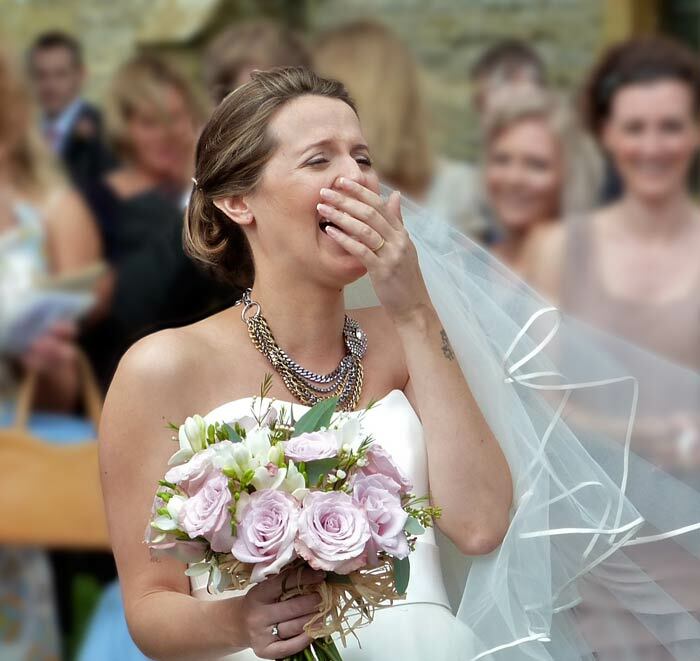 Her namesake "Faith" roses were the perfect flowers for her bouquet and a vintage collection of pots held her flowers in a 'tea party' theme for the reception at the Lygon Arms in Broadway. 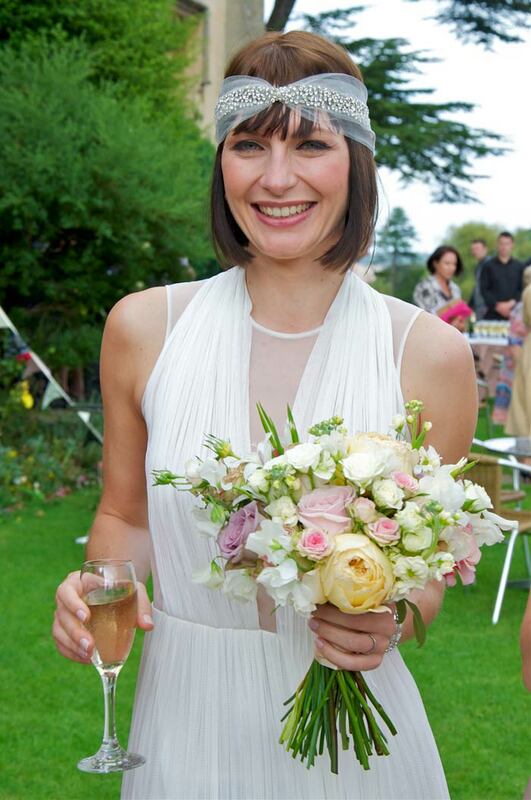 Lily of the valley combined with white roses were the feature flowers for Katy's beautiful spring wedding bouquet. 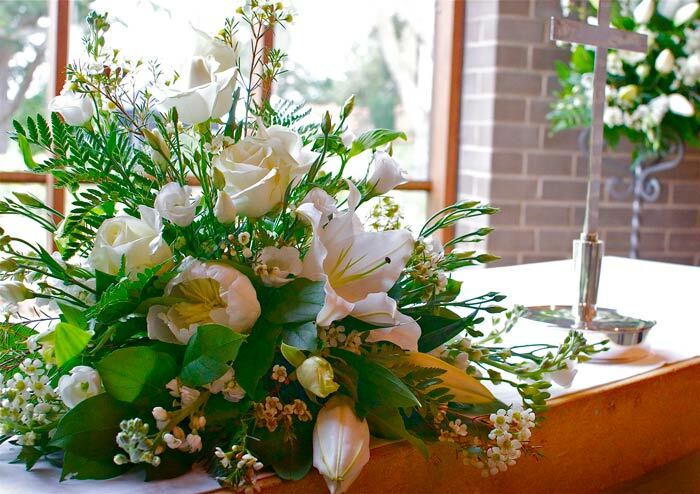 Married to Daniel in the tranquil setting of Holland House, near Evesham, the simplicity of her theme was perfect for their altar flowers and pedestals. 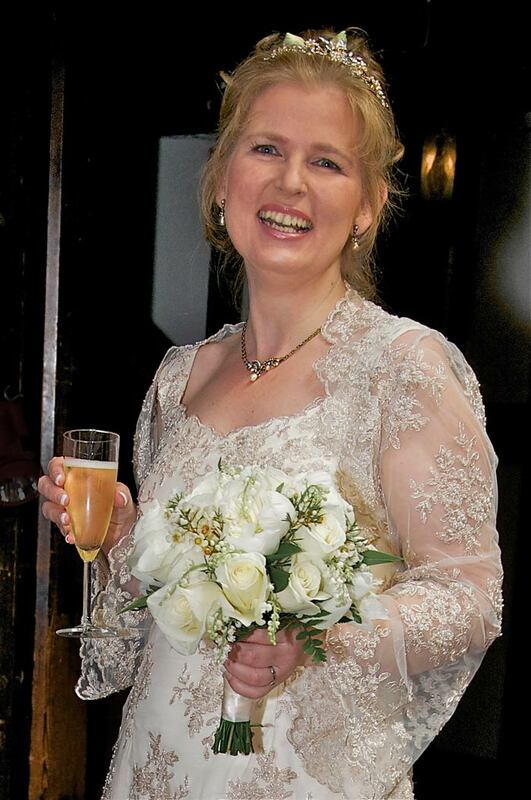 Dorothy's bouquet comprised of pink peonies, peach stocks, purple astrantia, 'Lydia' spray roses, 'spearmint' roses, 'two-face' roses, white astrantia and amaranthus (love-lies-bleeding). 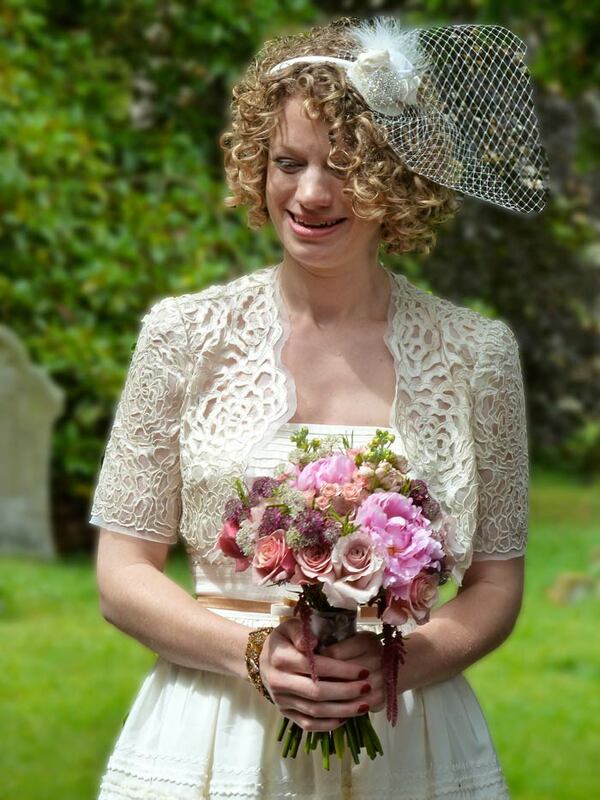 Everything was tied with a silk grey ribbon with matching vintage buttons. 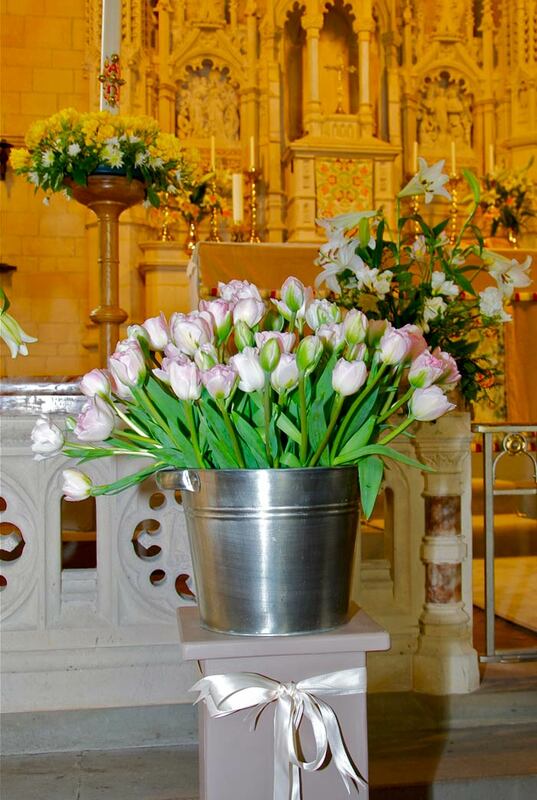 To return to the HOME PAGE from here featuring wedding flower designs for real brides, follow this link. 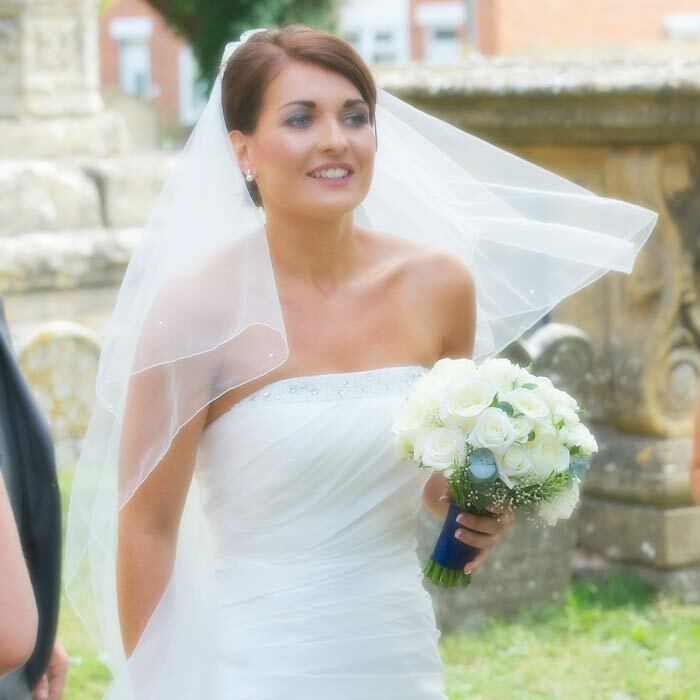 We would love to be able to help with your wedding flowers - or wedding photographs. 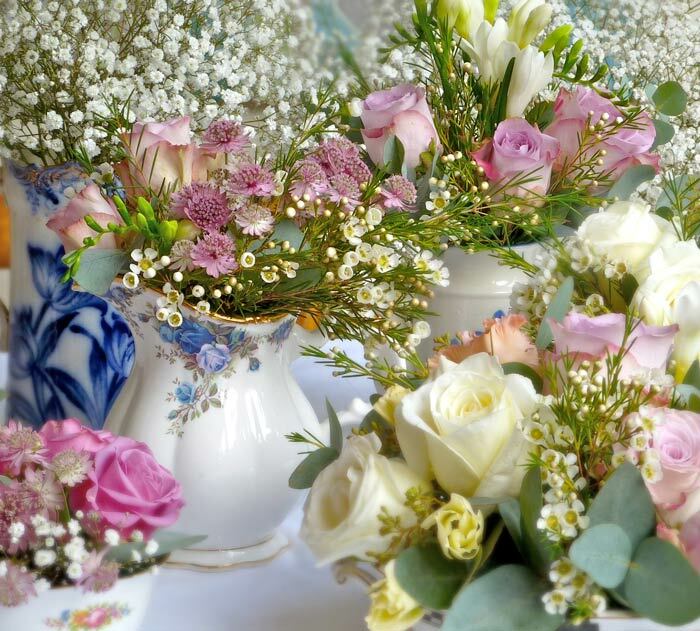 To get in touch with Catherine to discuss your ideas for wedding flowers, please ring her on 01386 832120 or complete the simple contact form below, and we will get back to you as soon as possible.